Perhaps you've seen one of these before. A couple of inches above and below the magnetic stripe reader are protrusions that allow just enough room to swipe a credit card. The barriers are a negative affordance (is that the right terminology? ); they make swiping a credit card awkward. I have to carefully place my card in the small space above the reader to start. After swiping I always end up jamming the card into the bottom barrier. If one wanted to apply Fitts's law to swiping a credit card, and intentionally violate it, this seems like a pretty good way to do so. Yet, there must be a reason those barriers were added, and it doesn't appear to be structural. RedBox had a problem a few years ago with people installing credit card skimming equipment on their machines. The equipment was often attached to the existing credit card reader. It was big and bulky, but a lot of people wouldn't realize that it wasn't the right hardware. I thought these barriers were put in place to prevent the skimmers. The barriers protect against the installation of credit card skimmers. When the credit card reader and blocks are positioned correctly you find that at least half of the credit card is inside the reader when you start swiping. This means that there is no way to place a skimmer on the machine that can capture the whole strip's data. Even if you had two read heads, one above and one below, there would still be a portion of the magnetic strip in the middle that cannot be scanned outside the existing card reader. I am fairly certain I know the answer to this question. We are currently in the process of designing a kiosk and the big question is whether we will use an insert style MSR or a front swipe style MSR. 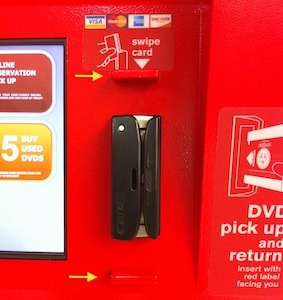 With the insert style, which we have on over 100 kiosks, people jam things into them all the time and they need to be replaced frequently (they cost about $80 each). What we are finding with the swipe style is that people somehow miss the MSR and hit they card against the face of the kiosk both above and below the MSR. Even with a powder coated paint the kiosk will quickly become scratched and scarred. The reason is to reduce maintenance costs of replacing MSRs and repainting the kiosks. Perhaps it is to prevent the card from hitting the surface of the unit above/below the swipe? I have seen card swipes where all of the paint is worn away below the swipe from people rubbing the card against the surface. This is just a guess, it really doesn't seem all that useful. If that's the case, then inserting the card with these barriers forces the user to do the whole thing (including the swipe itself) slower and increases the chances the card is insert perpendicularly until it hits the back. Assuming they've discovered the card reader's limitations too late (or it was cheaper than the rest to begin with), the barriers are an easy fix. Answering on if affects the usability, answer is yes. Which part of the usability and it is the perception of usage itself as it does not align with any other day-to-day usage patterns. It increases the cognitive load of the user in thinking how to avoid scratching the card while IN and OUT. Extraordinarily poor experience when it comes to motoring. The hand movement is designed to perform an arc with ease improving the UX*. Alternative could be to design this as an arc and also balance the security/fraud concerns. Not the answer you're looking for? Browse other questions tagged affordance physical or ask your own question.